Back when I was about 17 (so let’s guess 1987) I got my first electric guitar. I already had an acoustic, but it was time to move on to more exciting things. This one came courtesy of a friend of my brother’s, and cost me (if I remember right) either £40 or possibly £60. 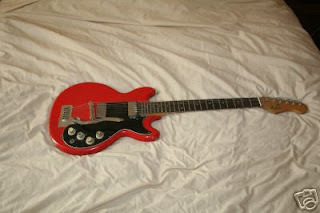 It had a red finish, with just a hint of orange, black pick guard, two chrome covered pickups with “Hofner” written on them and a maple neck with rosewood fingerboard. There was no name written on the head of the guitar, so I assumed it was rubbish, although I remember it played great and had a real ‘60s rock and roll tone to it. At the time though, what I REALLY wanted was a nice red Strat, and I wasn’t too keen on that far-too-much-of-a-hint-of-orange finish on my no-name, so I sanded the body down (very badly) and resprayed it black (also very badly). I changed the old-fashioned-looking knobs to some modern black plastic things and painted the head black too. I also changed the tuners to black Gotoh-type things. After a year or so, I sold it to a school friend and forgot about it for a few years. 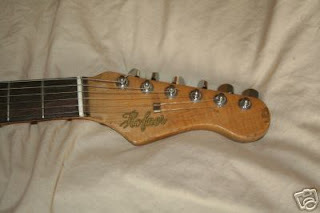 I thought about it a few times years later and tried to find out what sort of guitar it was, but had hardly any information to go on. 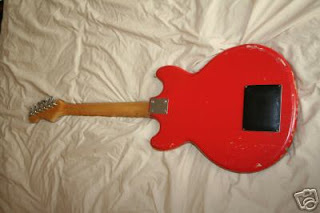 Going on the shape alone, I simply couldn’t find the same guitar anywhere, even on Google, so gave up on ever finding out what it was. I also tried pretty hard to get back in touch with the guy I sold it to, in the hope that he would still have it and would be willing to sell it to me, but without success. Forward wind to about 2005 and I found myself co-incidentally having a chat with the guy who sold that same guitar to my brother’s friend (before I got my hands on it). He told me a little more history. It seemed that the guy who had had it before HIM had stripped it down and resprayed it (very well, I might add). 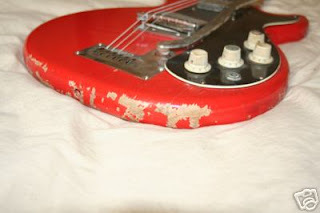 It was in fact a Hofner guitar, but the logo had been removed during the sanding process. This was enough info to really start my search. 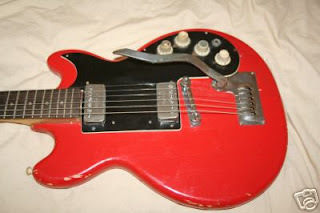 If you ever need to find out anything about old Hofner guitars, then I can’t recommend that site enough. With this new-found knowledge, I just couldn’t stop myself from searching for one for sale. Finally, about a year later, I found one exactly the same (including the colour) on ebay and managed to stick in a cheeky last-minute bid, winning it for something like £130. It is fairly bashed up, but nothing that can’t be restored. Here are the photos from the ebay auction. The moment I won the auction, I felt like I had corrected the 20-year-old mistake I had made when I sold my first ever electric guitar. I will need to respray this at some stage, but that's fine. As far as replacing the hardware goes, well, I need to restore the machine heads to a vintage style. 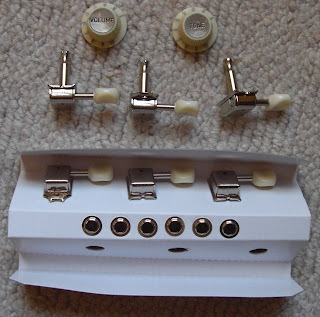 At some stage someone upgraded these to Gotoh-type tuners (I hardly have the right to criticise that, hehe), and I need to replace three of the knobs (two volume knobs and one tone knob), as they have lost their metallic labels, which can't be bought separately unfortunately. I managed to find one volume and one tone knob on ebay from a similarly-aged Hofner, and here's the best bit; I still have one of the knobs I took off my old Hofner 20 years ago. I also bought a set of vintage-looking Kluson tuners, that will look very close to the originals, but will work much better than they ever did. Just one small problem though. The guitar is in storage at my brother's house in Ireland and I'm in Taiwan, so the restoration will have to wait.